A tortoise called Fergie was stolen from a petting farm after allegedly being smuggled out in a visitor's hoodie. CCTV appears to show the tortoise being picked up by a man and passed to the woman at Blackberry Farm in Sussex. Owner Paul Harris said Fergie and her companion, another tortoise called Dexter, had been "inseparable". He said farm cat Boots was now keeping Dexter company, but that they would love to reunite him with Fergie. The man and woman seen on CCTV left the Whitesmith farm with four or five children at about 17:00 BST on Saturday before boarding a bus to Uckfield. 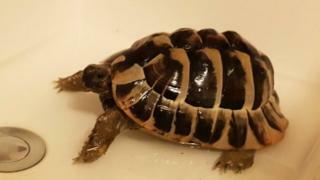 Mr Harris described the theft of the two-year-old tortoise from the family farm as "shocking". "We're a visitor attraction and we just can't believe it," he said. "Our cat Boots has now taken it upon herself to keep Dexter company, but we'd love for them to be reunited as soon as possible. "We're concerned for Fergie's welfare and we're urging anyone with any information to contact the police." The woman is described as white, of medium build, with scraped-back brown hair, wearing a grey Nike hoodie, black leggings and white trainers. Fergie and Dexter had been donated to the farm by a visitor and were both microchipped, police said.